Size of this preview: 612 × 600 pixels. Other resolution: 640 × 627 pixels. Deutsch: Ich beantrage in Ihrem Land Asyl und will, dass Sie all meine Kosten übernehmen. Ich erwarte, dass Sie auf meine kulturellen Besonderheiten Rücksicht nehmen, ich also Schweinshaxe bekomme und meine Frau im Bikini baden darf. 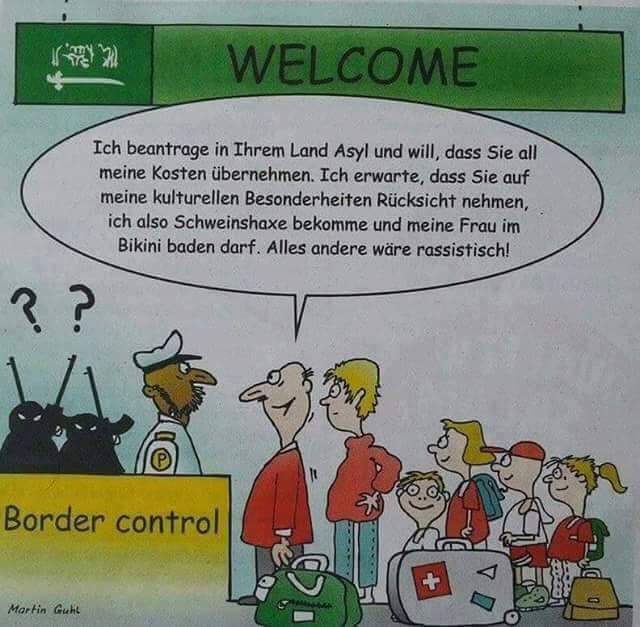 Alles andere wäre rassistisch! English: I'm applying for asylum in your country and I want you to bear all my expenses. I expect you to respect my cultural specialties, so I get pig's knuckle and allow my wife to bathe in a bikini. Anything else would be racist! Español: Estoy solicitando asilo en su país y quiero que paguen todos mis gastos. Espero que respeten mis especialidades culturales, así que me pongan los nudillos de cerdo y dejan que mi esposa se bañe en bikini. Cualquier otra cosa sería racista.